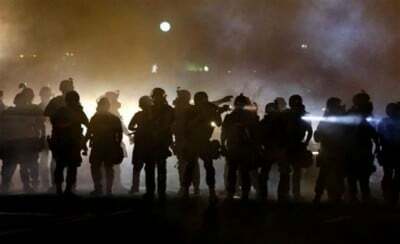 Riot police in Ferguson, Missouri, will continue to arrest journalists for simply walking down the street while covering the riots, according to a police captain early Tuesday. Missouri State Highway Patrol Capt. Ron Johnson made the startling statement at a press conference in Ferguson when asked if the 31 people arrested at the protests last night included journalists. Cop just ripped a press badge off the Vice streamer and threw it to the ground. Just because he could. This harassment of the press by police has been going on in Ferguson for the past week and even made international news when a St. Louis Co. SWAT team intentionally gassed an Al-Jazeera America news crew, forcing them to flee, and began dismantling their camera equipment before realizing that other media was capturing everything on tape. Infowars reporter Joe Biggs was also wounded that night when police shot him in the kidneys with a rubber round and not long before that, two journalists were arrested in the nearby McDonald’s. At the press conference, Capt. Johnson suggested he didn’t want more violence in Ferguson, but when Infowars asked him why the police were dressed like the military if that were the case, he refused to respond. On August 9, Michael Brown, 18, died after being shot by a Ferguson police officer, the shooting of which sparked off ongoing mass protests in the St. Louis suburb of around 21,000, to which the police responded with military tactics and gear.